If you are a woman who enjoys black licorice as a treat, we have some sad news for you. A new study from Finland shows you should avoid black licorice when you are pregnant. This is because consuming licorice during pregnancy was found to have an adverse effect on a baby’s growing brain. The study was performed by the University of Helsinki, the National Institute for Health and Welfare and the Helsinki and Uusimaa hospitals. Published in the American Journal of Epidemiology, a total of 451 mothers who participated in the study were contacted once their children reached the ages of 10 to 12. The researchers took a look at 378 children who ranged at around 13 years old. Around 51 of the kids’ mothers’ had eaten large amounts of licorice and around 330 had consumed either very little or no licorice during their pregnancies. It was discovered that a chemical known as glycyrrhizin, which is found in black licorice, tastes bittersweet and normally helps to sooth sore throats and fight off liver disease, can have a hugely negative impact on fetal development. When pregnant women consumed licorice, it was found that problems such as low birth weight and delayed development occurred in their babies. The researchers believe that the glycyrrhizin can reduce the amount of an enzyme in the placenta that is meant to protect the fetus from stress hormones naturally occurring in the body of an expectant mother. The 378 children who were examined during the study were examined to check for long term effects stemming from their mothers having consumed licorice during their pregnancies. The kids were asked to take cognitive reasoning tests that were administered by a psychologist. The researchers discovered that the children whose mothers ate large amounts of licorice while they were pregnant scored lower on the tests compared with those whose mothers consumed smaller amounts or no licorice at all. Overall, the difference was marked by around seven IQ points. Additionally, the children whose mothers had eaten large amounts of licorice had reduced memory capacity as well. The kids’ parents also told the researchers that their children exhibited more problems like ADHD than other children their age. 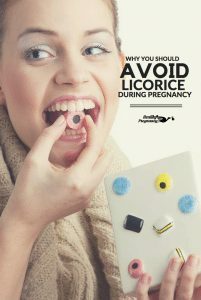 In addition, mothers of girls in the study reported that their daughters had begun puberty earlier, compared with girls whose mothers had consumed either little or no licorice during their pregnancies. Finland’s National Institute for Health and Welfare already has licorice listed in the category of “not recommended” for women who are pregnant. However, it states that the occasional small bit of licorice is not problematic and should not cause any problems for an unborn child. At the same time, the researchers assert that pregnant women as well as those who are planning to become pregnant should be aware of the effects of products that contain glycyrrhizin and that it is best for the baby to avoid overindulging in them.